An extraordinary repousse and pierced oval shape brass jardinière, robust lion heads are mounted at each end with twisted ring handles, and standing on lion paw feet. England, circa 1800. Oval silver plated Monteith bowl with loop leaf handles. 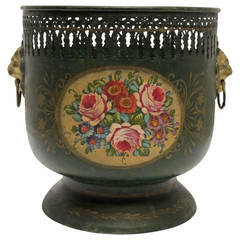 Great as a jardinière or cachepot. Impressed mark on the underside, French, 19th century. French polished brass jardiniere container lion head ring handle, 19th century. French polished brass lion head ring handle jardiniere claw feet, 19th century. French polished brass jardiniere with lion ring handles, 19th century. French polished brass jardinière with lion ring handles, 19th century.